Time stands still for no one and for students it seems to be going even faster. When in college, people come to realize that making timework is essential to academic success. The trust is, good time-management skills help people achieve their goals in every sphere of life. Proper planning, scheduling, and prioritizing your goals are the basic habits a student should acquire to live a stress-free life. Likewise, dissertation time management skills are essential for a student. Time management when writing a dissertation is not really different from managing time when working on any other important project. The first step towards successful completion of the assignment is making an exhaustive list of things to do to before the dissertation is considered finished. When the list is ready, break the tasks into smaller assignments, thus transforming your to-do list into a manageable plan. Think about the setbacks that might arise and reserve some more time for emergencies and unpredictable situations. Now when the lists are ready, get yourself two calendars – one that you will hang on the wall in your room and one that you will carry with you. Mark the dates when the steps from your to-do list are scheduled for completion. For example, you can note downthe planned visits to your advisor or library research days. Whenever you are planning something, such as an evening with friends or a trip to another city, check with your calendar to make sure there are no overlaps. Speaking about meetings with the advisor, they have to be planned beforehand, as well. Meet the advisor and ask them how often you need to see them. Ask about their expectations of the dissertation and your collaboration. You should never ignore the visits to the advisor once they are scheduled. If for some reason you are not able to come, make sure to inform the advisor in advance. Learning to manage your own time wisely also means learning to say ‘no’ to other people. If a colleague asks you to run them to town but you know that you need to be in the library at that time, do not be shy to say that you will be busy. If your friend invites you to see a new movie together, check your calendar first. If you have something else scheduled for that day, think about some other time when you can see that movie. It often takes much efforts and even courage to turn people down but it is vital for your own success. The following type of distractions is a little trickier. As a student, you will have a lot of other assignments to submit, tests to take, and papers to write and sometimes it might seem that there is absolutely no time for your dissertation. However, you can solve this issue by dedicating at least 10 minutes to your magnum opus between studying for exams and tests. A few minutes will add up to several hours and you will not fall behind the schedule. 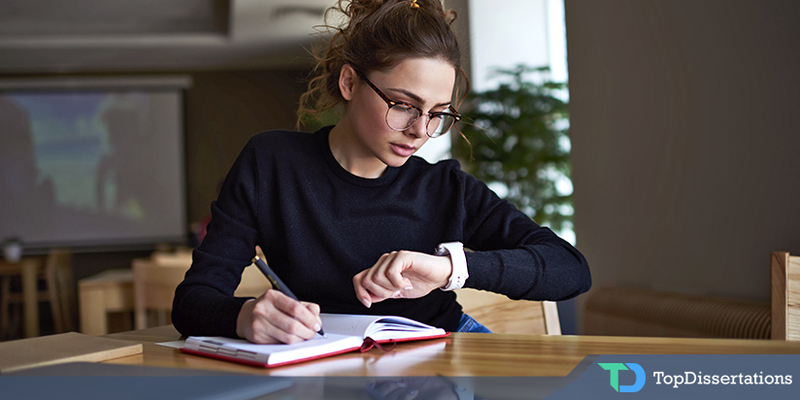 The list of time management tips for students would be incomplete without the advice to choose the most appropriate time for studying. People are all different. While some wake up at 6 am and are ready and willing to conquer the world, others are more productive at 6 pm. First of all, acknowledge this difference and recognize the time that works best for you. Plan your studies accordingly. If you ask a successful person about their rituals of the day, they will definitely describe them. The problem of students, however, is that they are overwhelmed with assignments and frequently forget about the activities they were planning to do. Developing a ritual of the day will help you stay focused on your bigger goal and will give you a sense of order in your life. Start by making a habit to spend a fixed amount of time every day working on your dissertation. Then, think about the little things that help you study. Maybe you need a cup of coffee to get the ball rolling. Or maybe you want to start with organizing your working area. This activity does not have to bear much meaning. Instead, it will be a small ritual that will prepare you to big work ahead. If you are looking for time management tips for students, you can meet with other people working on dissertations and ask them to share their experience and helpful pieces of advice. You might discover some useful methods. Moreover, a conversation with people who are in the same boat might inspire you to progress. Planning, setting goals, and keeping calendars are necessary for productivity but dedicating some time to yourself is equally important. Listen to your body and mind and remember to relax a little whenever you feel overwhelmed. These days, it is easy to stay busy. Your inbox is full of emails, friends keep texting you in social media, and your room definitely needs some cleaning. However, you have to come to terms with the idea that you will not be able to complete all the tasks no matter how hard you work. To-do lists are like seven-headed beasts. You might chop off their heads one by one but the new ones will keep growing instantly. For this reason, you have to learn to give yourself some room to breathe. Otherwise, the frustration will lead to a burnout. So one of the best time management tips for students is let go off the goals and tasks that do not support you, your mission, and your dreams. Try some of these tips and you will surely see that writing a dissertation can be easier and less stressful. Good luck!